Yesterday this movie premiered in one of the Indonesian cinema chains. No other major movie was released this week as they obviously save the date for one of the most anticipated Marvel movies this year, i.e. Black Panther, about to be released next week on Valentine's Day. My wife and I decided to see this movie for entertainment purpose and because we thought it would be a nice action movie. So here goes my views of the movie. 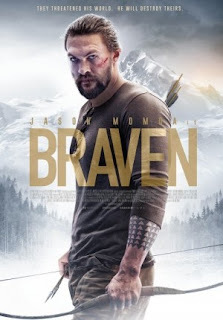 Joe Braven (Jason Momoa - Justice League, Game of Thrones TV series etc) was a logger who was having a happy life with his wife Stephanie (Jill Wagner - Road to Paloma etc) and his young daughter Charlotte (Sasha Rossof). Though he also had some problem regarding his father Linden (Stephen Lang - Avatar, Don't Breathe etc) who was suffering from some memory loss and would get into troubles. Braven also had a co-worker named Weston (Brendan Fletcher - Tideland) who was going to drive a truck full of lumbers that have been cut down earlier. When Braven decided to go to their cabin up in the mountains together with his father, they found out that there have been some heroins hidden by drug dealers led by a dangerous man named Kassen (Garret Dillahunt - The Last House on the Left, Raising Hope TV series etc). Braven had no choice but to stand his ground and save his loved ones by fighting against a group of men armed with heavy military equipment who were trying to get back their heroin and would kill everyone standing in their way. So could Braven return back safely to his family? Could they survive the onslaught of the experienced thugs? Find them all in this action drama movie. I have actually seen the trailer to this movie few weeks ago and I also noticed that the movie might be having a little bit of drama. What I did not expect was the kind of lengthy drama scenes which resulted to the lesser action sequence. The earlier part of the movie took very long, even from the start during the opening credit and I personally felt there were too many scenery scenes shown. I think the director was trying to make the movie to be around 1.5 hour duration, but ended up making the movie felt too draggy (even boring). My wife shared the same sentiment with me, since she also felt the scenery parts were not really important and too much. If it was supposed to show that the location was cold and snowy, I think that was already setup from the beginning. Aside from those draggy parts, the movie started to pick up the pace when finally Kassen arrived at the cabin. I always loved Garret Dillahunt when playing a villain as I think his cool no expression image really suit the kind of villainous look (my first impression of him was when I saw him in The 4400 TV series, but the one that I admired was when he played in Terminator: The Sarah Connor Chronicles TV series as, you guessed it, the Terminator himself). His characterization of the very bad person here was truly spot on. Meanwhile Jason Momoa seemed to be able to show a bit of dramatic role and Stephen Lang was quite convincing as an old veteran. The assault on Braven's cabin, the fights among those people and the suspense of how to save their lives were definitely the main attraction of this movie. Some of the fights here were more like street fights rather than fight by martial arts experts such as Jason Statham or Donnie Yen. But that actually made the movie more believable to my opinion, since Braven was supposed to be a family man character without military background anyway. There were very few funny moments and the movie felt overly serious. Due to many crude language used and the rather violent scenes of the killings, this movie is not suitable for children. It even got an R rating in the US. Overall my wife and I were quite entertained with this movie, though we felt that if those not really important scenes were lesser, it would have been more satisfying. So if you are looking for a full action movie and expect to see Jason Momoa have numerous endless fights, then this might not be adequate. But if you are looking for an action heavy on drama movie located in the snowy mountains of Canada, then this one probably would suit you. Btw, I also remembered another movie where it was shot entirely in the snowy mountains, but more of a thriller titled Wind River. Perhaps if you prefer a more thriller movie, that would be more to your liking. The choice is yours.